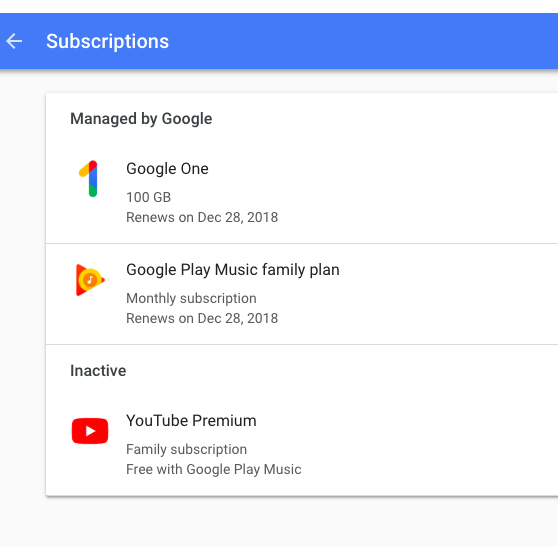 I currently have a Google Play Music Family Subscription. This morning, I opened the YouTube app and got a message that said my YouTube Premium Subscription has ended. Now, instead of access to YouTube Red, Google Play Music subscribers will get YouTube Music Premium: A music service that's strikingly similar to Google Play Music. I've still got my YouTube Premium and I pay for Google Play Music. I am in a similar situation and am currently on the phone waiting to talk to someone about this situation. Before being sent to the google play music phone support queue, the person I was talking with said they seem to be experiencing an issue. Hopefully, I'll know more soon? It appears that there is an "issue" with some accounts. I talked with someone from the youtube/play music support team and they confirmed I'm affected and are escalated it. Now to wait for them to let me know when it's resolved. Is it just limited to Family Accounts? I don't have a family account, and I still have YT Premium. I just checked YouTube and it was fixed. I am glad to know that the issue has been resolved. Where is the clipboard on my style 2?